Villa "Olympus" is located 100 meters from the sea shore and a wide sandy "Golden Beach" in a unique climatic zone. The four-storey hotel provides 26 comfortable rooms. 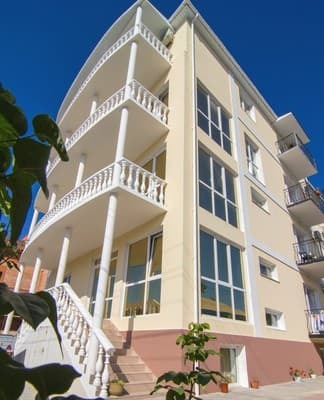 In each room: balcony, refrigerator, air conditioning, kettle, dishes, satellite TV, bathroom. The frequency of cleaning in the room - daily. At guests' disposal there is: Wi-Fi, 3 meals a day in the private dining room, transfer from the railway station in Feodosia, as well as in the villa parking lot, playground and outdoor pool, table tennis, gazebo, bar, cafe, shop. Change of bed linen - 1 time in 5 days, and a towel every other day. On the coast, for an extra charge, sea excursions, water bicycles and motorcycles, boats, boats, water skiing, and children's entertainments are offered. There are many excursions: visit the picture gallery of I. Aivazovsky, the house-museum of A. Green, the museum of local lore and the museum of money, the water park and dolphinarium in Koktebel and other monuments of the history and beauty of the southeastern Crimea. PRICES MAY CHANGE, YOU NEED TO RECEIVE INFORMATION FROM THE OPERATOR! Description of the room: Double room with a total area of ​​14 square meters. m is provided with everything necessary for comfortable living. The frequency of cleaning in the room and the change of bed linen - at the request of the client. Description of the room: The room has a total area of ​​18 sq.m., which is provided with everything necessary for a comfortable stay. The frequency of cleaning in the room and the change of bed linen - at the request of the client. Description of the room: Two-room suite with a total area of ​​36 square meters. m is provided with everything necessary for comfortable living. The frequency of cleaning in the room and the change of bed linen - at the request of the client. adult for 50% of the cost of the main place; children (from 3 to 12 years) for 30% of the cost of the main place. Children from 3 to 12 years old are accommodated for 50% of the cost of the main place. Children under 3 years are accommodated free of charge without a seat. Villa "Olympus" is located in the village. Beregovoe in 100 meters from a coast of the sea and wide sandy "Gold beach". Distance to the cities: Simferopol - 110-120 km, Kerch -90 km, Feodosiya - 7 km. 1. 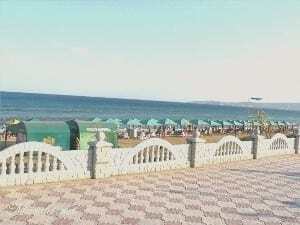 By plane to Simferopol airport, then by intercity bus to the bus station of Feodosiya and city bus No. 106 to Brigantine stop. 2. By train to Feodosia or Simferopol or Dzhankoy or Kerch (ferry), then by intercity bus to the bus station of Feodosiya and city bus number 106 to Brigantine stop. 3. Intercity comfortable bus. You can also take a taxi or book a transfer.